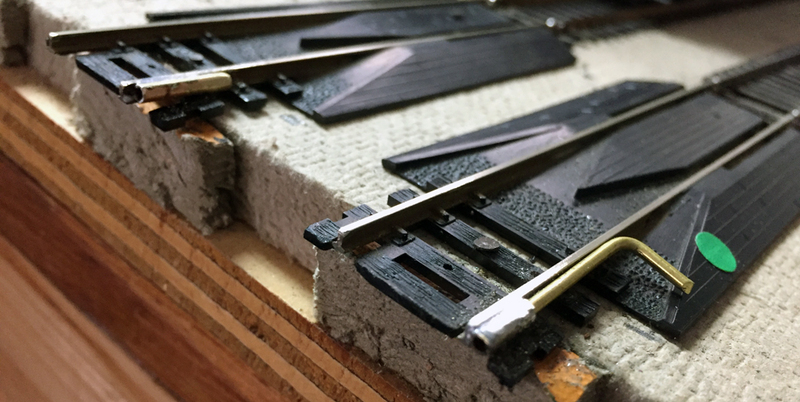 Using as my title the phrase familiar to anyone who has traveled on the London Underground (or on other British train systems in more recent years), I described how I undertook the correction of a rail gap between my staging drawer and the main layout. That post can be found at the following link: http://modelingthesp.blogspot.com/2017/10/mind-gap.html . 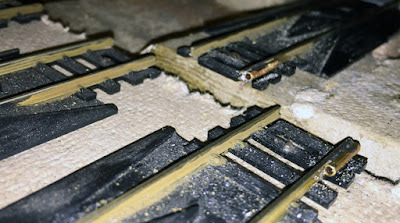 But as I knew even when making the rail gaps shorter, as described in that post, it is still essential in HO scale to align the rails even more perfectly. I already had an idea of how to achieve that better alignment. It is not an original idea at all, but is something I observed on Roger Nulton’s S scale layout in Tacoma, Washington, when I operated there last year during the SoundRail event (see my description at: http://modelingthesp.blogspot.com/2016/03/soundrail-2016.html ). Roger has a sort of “drop door” section to allow entry into the layout interior, and when the door is raised to close it, alignment of the rails is completed by sliding a sturdy wire “bolt” through tubing that is soldered to the outside of each rail on each side of the gap. I didn’t get a good photo of the arrangement, but Roger was kind enough to send me one. As you see below, his arrangement has the further complication to be located in a scenicked area. I have now shamelessly stolen Roger’s idea, and have added essentially his arrangement to some of the tracks on my staging drawer, and may eventually add it to all of them. For this design, I used K&S brass material, first their 3/32-inch x 0.014 inch round tubing (stock no. 1144), and for the “bolt,” their 1/16-inch brass rod (stock no. 1160). Once the tubing is cut into appropriate lengths with an abrasive cut-off disk, and the ends cleaned up, the pieces can be tinned, along with the rail sides. (Some pre-fab track has high spikes which may need to be cut away for the tubing to fit.) 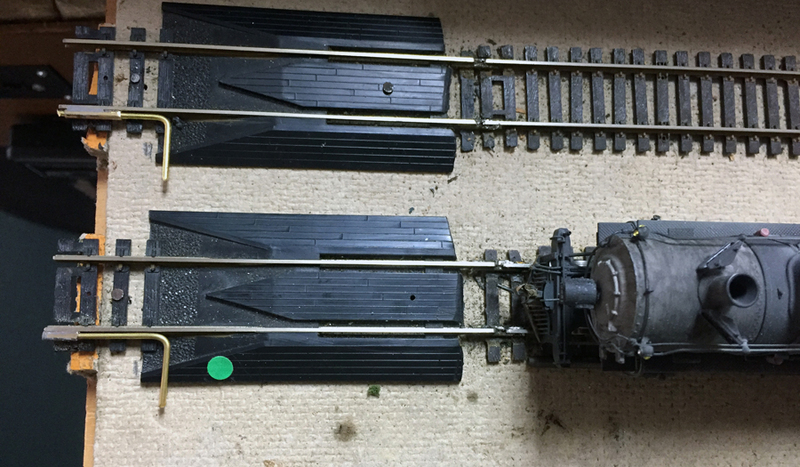 In HO scale, this 3/32-inch tubing fits nicely alongside Code 100 rail, which is what I have on my staging drawer. 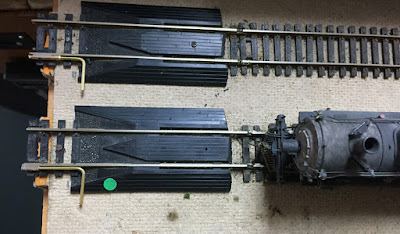 In the photo below of the right end of my drawer, the nearer track (the staging drawer side) has tubing attached, as does the far track (the layout side). The drawer of course has not been aligned with the layout trackage, but is positioned for photography only. I then experimented with the 1/16-inch rod to make various “handles” for the sliding key. My first try at the key or “bolt” part has a small “handle,” as you can see in the photo below, but there is no reason for it to be this small. These tracks are at the left end of the staging drawer. When connected, my tracks then look much like Roger Nulton’s arrangement, as displayed in the photo at the top of the present post, as you can see in the photo below. I sometimes use a small flashlight to get a good view while connecting these, as the lighting in my staging area is not the greatest. Below you see the right end of the staging drawer as connected. This system works great and so far has not caused even a single derailment (knock on wood! ), and of course that means I’m really satisfied. I think this easy connection could work in lots of layout situations. Lastly, let me say one more time that this is not my idea at all, but was totally copied from the way Roger Nulton does it on his layout.